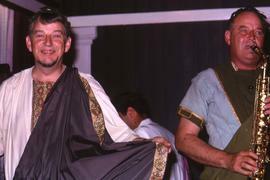 Colour Kodachrome 35mm slide depicts two unknown men who are wearing what appears to be Grecian or Roman costumes and one of the men is playing the saxophone. Snider #24 is written in red on the slide. Colour print depicts musicians at the Congregation Har El event honoring the philanthropy of Dr. Irving and Phyliss Snider. Colour Kodachrome 35mm slide depicts men performing and playing instruments. Crowd watching people do Scottish dance with man playing bagpipes. Photograph attached to scrapbook. It depicts children from a Children's Aid Society receiving home enjoying some entertainment at an Easter party. Photograph attached to scrapbook. It depicts a ventriloquist performing for a patient at Vancouver Children's Hospital during an Easter party. 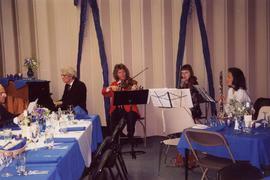 The party's entertainment was arranged by B'nai B'rith Lion's Gate Lodge. Photograph attached to scrapbook. It depicts entertainers performing at a Children's Aid Society Easter party. The entertainment was arranged by B'nai B'rith Lion's Gate Lodge. Photograph attached to scrapbook. It depicts an entertainer performing for children during an Easter party at a Children's Aid Society home. The entertainment was arranged by B'nai B'rith Lion's Gate Lodge.